My dad uses his to make guacamole. It comes out soooo good. In that second picture, it looks like the elder lady is making atole. Mmmm good stuff. Are those also tortilla presses in that pic? Nelio you do need a woman!!!! Well yeah i need one but not for that, lol. My grandma used to say: "if your girlfriend doesn't use the metate, molcajete or doesn't know how to make tortillas don't marry her." lol... that sounds way familiar. I get the "if she can't cook beans, don't marry her" version. I know my Mom has one, and used to use it but hasn't in the longest time. More convenient to use a blender. No complaints. If she had it out, it'd just be another rock she can throw at me when i piss her off. 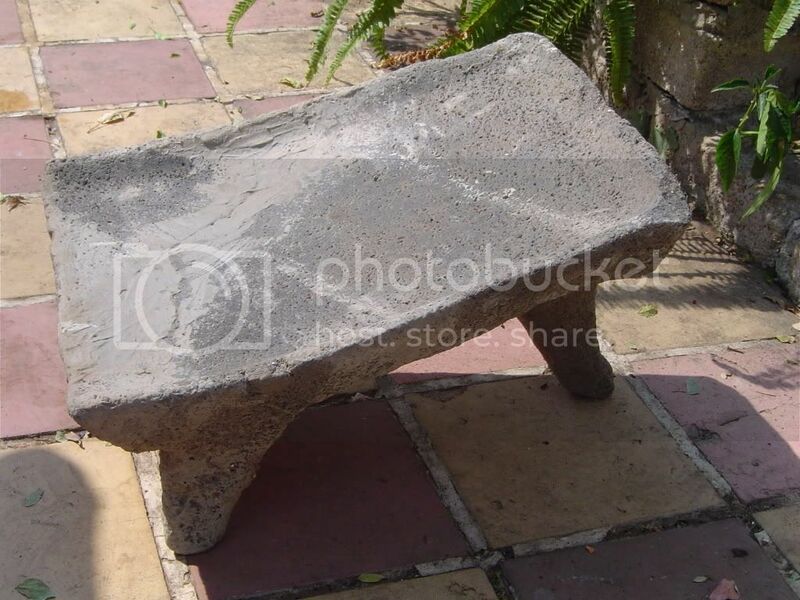 How many women here know how to use the metate? I have a little one and I use it for grinding spices or garlic. The bigger one, I heat it up in the oven and use it to keep the frijoles or tortillas hot when I have lots of guests over for dinner. Ok people lets get one thing straight. A metate is a flat stone to grind corn on, among other things. A molcajete is a stone in the form of a bowl to grind spices or make salsa. I just had to make sure we get the names right. I odn't know why but it was irritating me. Depression is a great power of Opression but having Peace in Mind and Soul is the Pocesion of a Greater Deed. I just had to make sure we get the names right. I don't know why but it was irritating me. Thank you...I was getting irritated as well with the mix up. And props to those who continue using them in their different uses. Thanks for clarifying. I thought they were different until people were telling me they were the same. Got confused for a while. Assuming by it's style. The most it can be is 200 years old. Nice. I have my great-great-great grandmas on both sides of the family cause no one wanted them. Till now I didnt know what they were. My grandma wants to give it to me bc she knows I'll take care it and she knows I won't sell it. LOL. This metate from what I know it is from my great grand mother (native) who gave it to my grandma (white) bc she was marrying my grandpa (native). guacamole and salsa's come out tasting better with the molcajete. nothing beat a tortilla made in a metate and a salsa made in a molcajete. There's one in the kitchen, don't know if it's out right now but I've seen it. no bc you won't buy me one!